If your vacuum is running hot, not at all, smells bad, or just does not pick up dirt and clean your carpet like it should, then bring it in for a free estimate. You may be surprised that our thorough vacuum service is very affordable. 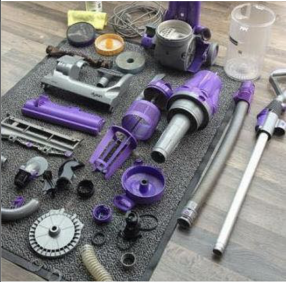 Our certified technicians are skilled at repairing all makes and models of vacuum cleaners. And, our estimates are free so visit one of our locations. We Service All Brands of Vacuum Cleaners! We repair all brands including: Hoover, Eureka, Electrolux, Dirt Devil, Royal, Sanitaire, Miele, SEBO, Simplicity, Riccar, Dyson, Bissell, Shark and much more! Call or stop by for more information. We'd love to talk to you.